We were recently sent an ingenious little gadget - a Family Charging Station for multiple devices including phones, iPods and MP3 players. It's very neat and keeps all the cables cleverly tidied away in little compartments which means that you're not searching for those elusive phone chargers every time you need them. We have ours on the breakfast bar and just pop our phones in before breakfast and they're ready to go by the time we leave the house. Such a simple idea, and I'm kicking myself that I didn't think of it first and get the patent in quick. A little while ago I took delivery of a pair of vivid red shoes. Hotter Shoes is a family run, North-west company who are passionate about shoes that are designed with comfort in mind, and when I looked at their website I was surprised at the range of styles and colours. I eventually opted for the Starshine in red, and I can vouch for the comfort factor! I decided to wear these for my early morning walks with Tessie, before changing to go to work. What actually happens is that I put these on and then realise later in the day that I'm still wearing them. That's comfort for you, and in my job where I'm on my feet for most of the day that important. Yesterday we got to try out the new mobile in-car wifi system - or MiFi - from 3 Mobile Buzz, who very kindly sent us one to try out along with an iPod Touch, tickets for Camelot Theme Park and some bags of sweets for on the way! 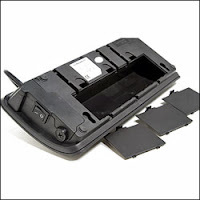 It's about the same size as a small mobile phone and once charged is placed in the car window for maximum wireless connection. The good news is this: MiFi is genius. We had the iPod Touch playing music from Spotify and The Teenager used it for checking emails and looking at the internet - all in the backseat of our car. Actually, if I'm honest nobody else got to use the iPod Touch because we couldn't prise it out of her hands. I'm just hoping it doesn't go missing before we have to send it back..
We only encountered one problem with the MiFi -we lost our wireless connection for a short while on the M6 strangely enough, although it was fine on the B roads and the M56. And on the way home we just couldn't get it working, but I think that's down to our idiocy. The MiFi is going to be a 'must-have' gadget - there are so many things could use it for: directions, playing your iTunes playlist, checking business emails, you name it. It's already been described by one blogger as 'the future of mobile broadband' and I'm inclined to agree. The bad new is this: after a week when we had been to Los Angeles and visited Disneyland and Universal Studios it was a big mistake to visit Camelot. It could never live up to the other two could it? Ho hum. Never mind.